The acupuncture facial is a modern twist on an ancient art. Leave looking younger and feeling even better. It's truly rejuvenating. Our faces carry so much tension from every forced expression to every genuine one. Releasing the tension in the face is truly rejuvenating. Acupuncture relaxes facial muscles, increases circulation, circulates lymphs, boosts collagen and elastin, and tones muscles. Beneficial for wrinkles, fine lines, sagging facial muscles, detox, puffiness, relaxation, and tension in face, (including jaw tension). In general, acupuncture is great for acne, dry skin, and other skin conditions whether they are on the face or elsewhere. Both the face roller and Gua Sha can relax and tone facial muscles, reducing fine lines and leaving you feeling relaxed. They are a great addition to any facial rejuvenation session or as a DIY technique. The face roller is another ancient beauty secret that is great for cooling the face and reducing puffiness. 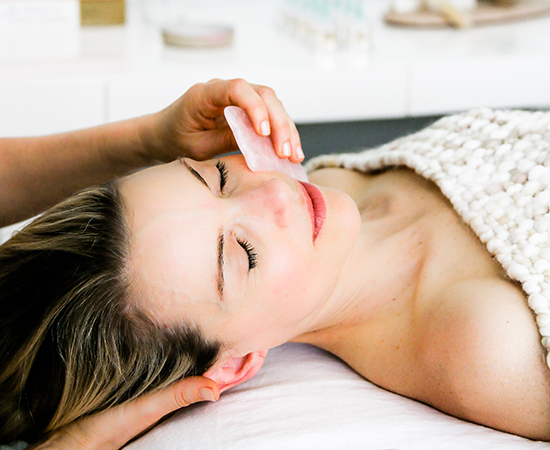 Gua Sha on the face moves lymph and is great for detox, increasing circulation, and boosting collagen and elastin. Ready to try facial rejuvenation?